* Includes a free gift bag. We maintain a limited stock on these birthstone rings. Please contact us if your selection is out of stock so that we can help you out as soon as possible. SALE! 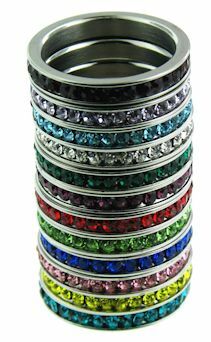 Buy 2 stainless steel birthstone rings @ $11 each, Buy 3 or more birthstone rings @ $10 each! 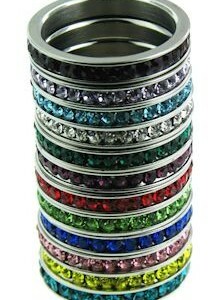 These stainless steel rings feature flashy cubic zirconia birthstones wrapped all the way around. Each ring includes a complimentary jewelry bag.